I'm planning to take on building a grow light, partially for the fun and mostly because I want a quality light without the quality price tag. Hydro-grow has the spectral mix I would want. I have no experience with grow lights and have only done super simple LED builds. I'm looking for anyone with advise on where to source my LED's and components from, and if anyone has done a grow light build before? I don't know a huge amount about grow lights... but out of curiosity, why would it have green and IR when the plant absorbs roughly as such? The vast majority of lights I've seen are basically a 2:1 or higher ratio of red and blue. Are you sure this isn't a marketing gimmick? Yeah, don't use green light. The reason plants are green in the first place is because they REFLECT green light, aka, green light is useless to plants. Most, if not all grow lights I've seen are specifically red and blue/violet mixtures. I've made my own grow light strip using a bunch of 10 watt bright white chinese LED's. First thing, you'll need to deal with heat if you're using high power LED's. Like, big time. I have a pretty sizeable heatsink on mine and i still have to use three fans to keep heat down. Next, do NOT skimp on your LED lamps. For whatever reason a bunch of the LED's I used have failed. The bond wires connected to the LED die seemed to have somehow "disconnected" from them. I can push directly on them and the dies light up again, so. Do NOT get cheap LEDs. Alternatively, just get a BUNCH of smaller LED lamps and parallel/series them..
That's another big thing, power supplies. I used a server power supply to power mine, and it works great. Hope this info helps a little. That company talks a big game, they bin their diodes ect, but I don't know enough about grow lights to say it isn't a gimmick, it could be. 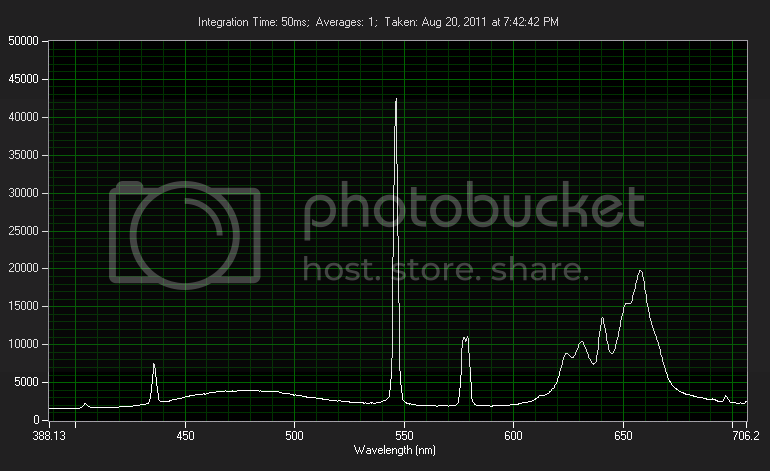 I'm still working on what wavelengths and what ratio to use. It did help.... a little I have a pile of small red/blue LED's and a few decent white LED's on hand I figure I'll use to do a warm up build. With all the suppliers out there how do you identify quality LED's and power supplies? Also how would you recommend wiring up all the LED's since they have different voltage requirements? There might be something to the green light & near IR. To produce a high quality plant, it is not enough to use just red and blue light typically found in conventional horticultural LEDs. The same applies for High Pressure Sodium lights, which are dominantly yellow. A good balanced ratio between red and blue light, needs to be complemented with far-red and green in right proportions for the right applications. For example far-red, 700–800 nm is critical for flowering of many plants. Less is known about the green, 500–600 nm area, but recent research is finally able to conclude that this is also important for plant development. Besides being potentially harmful, plants also show photomorphogenic responses to UV-B (280-315 nm) radiation. Both UV-B and UV-A (315-400 nm) radiation are important in inducing production of phenolics, anthocyanins (coloration) and antioxidants in plants. Thus the full spectrum from about 350–750 nm at a suitable light intensity is interesting in plant cultivation. The key is then to create a light which is optimally suitable for its task, by balancing the different areas so that the plant gets the right energy and signals to achieve the growers’ goals. Nasa has a great article on growing with led's. I'm too lazy to find it. but basically, more blue in the 460 range and less red during veg. then add more red 660 to induce flowering. in mj, and most plants with just these 2 colors the leaves will turn purple. you need the green light surprisingly to get the green plant color. Even if there are some obscure pigments that benefit from odd colors, targeting everything perfectly isn't possible since it will vary from plant species to species. The poor spectral width of an LED makes it a fool's errand anyway. Using THAT many colors at once will just make a white light regardless since the widths all overlap. Even if they're better than red/blue, they're not superior enough to warrant their silly asking price or the silly complexity. Paying an extra $200 or whatever isn't worth a 40 cent savings on your electric bill. If red/blue isn't good enough, just use a warm-white. That's my recommendation anyway. I remember reading that a lot of grow lights use much more common and cheaper 635nm red LEDs, and that plants usually want the ~650-660nm variant that are more expensive. Seeing that red lasers are in the 650-660nm range, I thought that might be a suitable way to supply that wavelength if you don't focus the light. You can also use fluorescent lights for growing plants. The Plant and Aquarium type bulbs work well, as do Kitchen and Bath type. I tried using some on some tomatoes and they worked; the latter type of bulb were easier to find at my local store. Yeah, lasers would be cool. But they're also far more sensitive to corrosion, shock, temp, and drive circuitry. The output from a standard DVD diode is comparable with a 1W LED, so you'd need a LOT of lasers, unless you find a source of huge multimode diodes for cheap. Here's an old fluorescent grow lamp I have that's commercially available. "grow lux" I think is the maker. I only have this because the ebay seller sent me the wrong color temp. The peaks at 436, 546, and 578 are the unavoidable mercury lines inherent to all fluorescent lamps. There's a wide-band cyan phosphor, and a few red phosphors. but think about this... why aren't there any good quality grow lights on the market. real growers still use mh for veg and hps for flower for a reason. I dunno about that. These guys are producing 10,000 heads of lettuce with LED. That reason is the initial investment is a lot smaller. 1000W of HPS is <$100. The equivalent light output in LED is going to be ten times that. HID is quite efficient, but still less efficient than LED. Each have their advantages. Anyone have a recommendation for a site or brand to buy LED's from? Anyways I figured I would share pics from my warm up build. I only used parts I already had, didn't cost me a penny, I also went completely function over form so it isn't pretty but isn't all that bad either. Thanks for the wavelength recommendations, I'm planning on going with 4:1 ratio of warm white led's to cool white led in the next build. I printed a simple body for the light, used an old cpu fan, 4 cree led's, an old RC heli charger for the power supply, 12V 1.5A, and heat sink from an old graphics card. I thermal epoxied the leds to the sink and I was using bare wire between the led's so as I glued in the sink with silicone I just gobbed it over the wire to insulate it. My sprouts seem to be liking it.